Solid competition characterizes the global non-ionizing radiation market, which at present is led by Mirion Technologies Inc., Narda Safety Test Solutions, and Spectris plc. The competition among the three is expected to heat up in the near future: these deep-pocketed players are seen pouring large amounts in coming up with more technologically superior and effective products to detect presence radiation. A report by Transparency Market Research predicts the global market for non-ionizing radiation (NIR) to rise at a steady 4.57% CAGR between 2016 and 2024. At this pace, the market which was worth US$49.4 bn in 2015 would likely reach a value of US$73.8 bn by 2024-end. The volume of shipment is expected to become 547.36 mn in the same period. Depending upon the type of device, the handheld devices hold a leading share in the global market for non-ionizing radiation (NIR) market. This is mainly because of their hassle-free usage and continued technological progress leading to more evolved versions. Our in-house team of analysts predict this segment to gross US$37.9 bn revenue by 2024-end. Geographically, North America led the market with a significant 44.0% share in revenue in 2015. 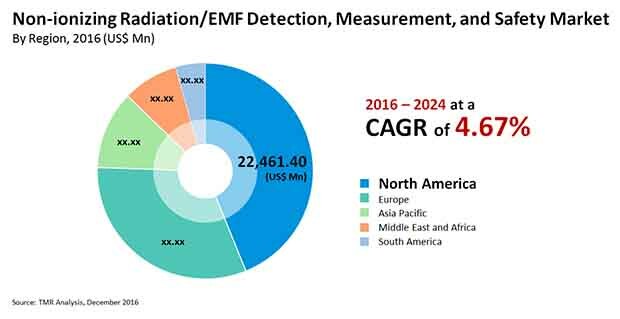 Presence of numerous non-ionizing radiation/EMF detector manufacturers is mainly responsible for the growth of its market. Going forward too, the region is expected to maintain its lead. Another factor that is likely to catalyze growth in the global market for non-ionizing radiations (NIR) is the swift uptake of electronic support measures (ESMs). One factor posing challenge, thus preventing the market for non-ionizing radiation (NIR) from reaching its full potential, is the need for continued, large investments in cutting-edge research and development of the devices so as to come up with more sophisticated products to meet the varied needs of consumers. This somewhat reduces the profit margins of manufacturers. Apart from that, need to adhere to various strict rules framed by authorities across nations is also dampening growth opportunities of players.